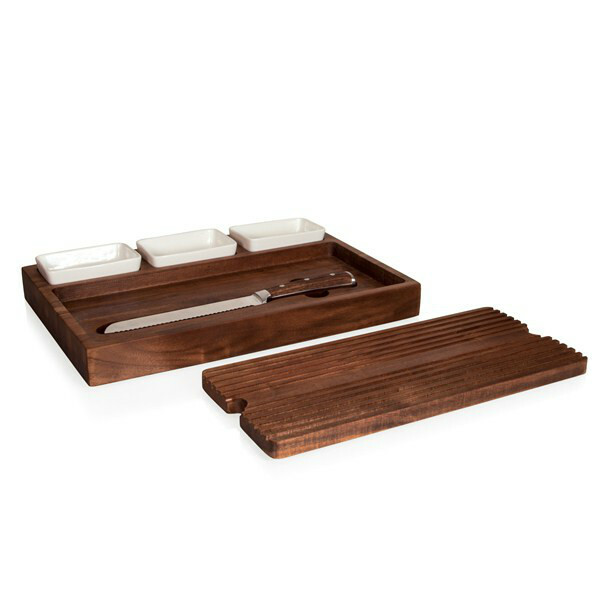 Carved from a solid piece of acacia, the Bruschetta features a removable bread crumb tray and a bread knife that sits in its own slot under the tray. Three ceramic dishes sit atop the board to hold olive oil, tapenade, pesto or your favorite relish. Add a loaf of crusty Italian bread and dinner will just have to wait. Carved from a solid piece of acacia, this reversible cutting board features a removable bread crumb tray and a forged steel bread knife. Three ceramic dishes sit atop the board to hold olive oil, tapenade, pesto or your favorite relish.